At BESTEK, products quality and user experience are the goals we are always pursuing. We look forward to hearing and collecting everyone's voices to make better improvements in R&D, sales and customer service. As BESTEK Super User, you'll enjoy the free trial for new products, take part in improving user experience research, product testing, exclusive discount (like 30%-50% off on new arrivals), and the benefits of customized rewards for annual super users. Come and Join "Super User" Now! Submit your previous reviews on any products from any websites here (no brand restrictions). Apply for the free trial opportunity of the world's best travel adapter from BESTEK. Please briefly describe what kind of collaboration you have in mind and what you expect from BESTEK? We will contact the winners above by mail within 3 working days. If you have any queries, Pls feel free to contact BESTEK Support team. This is a long-term program, more top seller products will be updated. Pls Stay tuned for the new FREE trial release. Thank you for choosing BESTEK! We look forward to hearing any of your feedback on BESTEK products! Is a Car Power Inverter Essential for Traveling? Iwant a free iphone xr so please give me iphone xr. Can't wait to hear from you,I am ready. You want the truth I am the one. I appreciate the opportunity to get quality product for free or a substantially reeducated cost. I feel I can do honest reviews on products used. I am in need of a free vacuum cleaner , ny son has 2 and won't let me borrow or have one . I like to keep my crappy mobile home clean same as the next person . I have never heard of BestTek giveaways , I hope my name is drawn . After seeing how you followed up remarks on one of your products and then made the changes to correct/adress the initial product. I feel Bestek is a company I could get behind. I tried to see the other link you sent but it didn't fit on the screen. I would really love to get involved with this program. I feel that I would be very good at it. I have never done a product evaluation. But I have worked in the home health field and now in the security field so I understand the importance of true and accurate evaluations. Bestek's Best Tech, now that's what I'm talking about. The power source is a good thing to have! Don't bother me with ***** scams just to get info I'm not giving out. Need to try this out,my kids are always take my stuff, need my own better stuff! I would like to check out the Inverter and other Bestek products and provide an honest review. I'd like to join your program, but can't use the power inverter. This is the first time I have ever been in this type of service before. I can't wait to try your product. Thank you. Hi Denis, thanks for your support. You need to click "Apply Super User" above to submit the review link and complete the application, and there is a chance for you to try our 150W power inverter for free. Hi Shannon, thanks for your support. You need to click "Apply Super User" above to submit the review link and complete the application, and there is a chance for you to try our 150W power inverter for free. Hi Betty, reviews you have written on social media (Facebook, Twitter, Instagram etc.) or other platforms like YouTube, community forums, blogs, and deal websites are also available. You can then submit a review link and complete the Super User application above. I don’t write reviews on social media and had an issue with amazon account reviewing products. I can still test and provide feedback. Hi Ram, thanks for your support. We are collecting some reviews now, you can get the chance to trial our 150W power inverter for free only by submitting the review link(No brand restrictions)above. I could really use this. It would be so handy. Hi Polly, thanks for your support. You need to click "Apply Super User" above to submit the review link and complete the application, and there is a chance for you to try our 150W power inverter for free. Best designs great products with great design based on my experience with humidifier.Would be great to try additional products. Hi Swapna, thank you for supporting BESTEK. You can get the chance of free trial for our 150W power inverter by completing and submitting the super user application above. Hi Megan, thank you for supporting BESTEK. You can get the chance of free trial for our 150W power inverter by completing and submitting the super user application above. I would love the opportunity to try and review your products. Hi Kimberli, thank you for supporting BESTEK. You can get the chance of free trial for our 150W power inverter by completing and submitting the super user application above. Great products at a reasonable price. The BESTKEK 6-Outlet surge protector power strip is great! You can tell it's made of high-quality material. I've been using it for half a year and had no problem at all. Hi Owen, thank you for choosing BESTEK. Now you can have a chance to try our 150W power inverter for free only by completing and submitting the super user applicaiton above, come and join us. Hi David, thanks for your support. We are now in need of your opinion of our products. 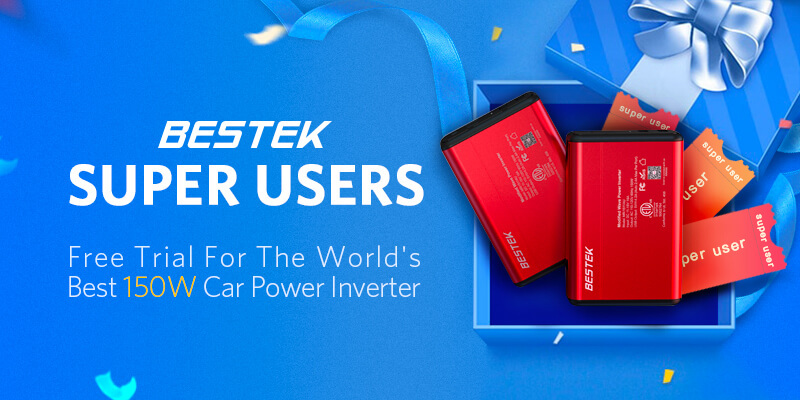 Complete and submit the super user application above, you'll get the chance of free trial for BESTEK 150W power inverter. Hi Robert, thanks for your support. You can get the chance of free trial for our 150W power inverter by completing and submitting the super user application above. not sure if i filled this out correctly but I tried. Hi Allen, we'll carefully review your super user application if you have filled out and submitted the form above, thank you for your participation. THANKS SO MUCH WANT TO TRY ! Hi Laura, thank you for supporting BESTEK. You can get the chance of free trial for our 150W power inverter by completing and submitting the super user application above. I purchased recently 150 watt car inverter. Fan always running and its sound annoying. Normally, in other inverts fan runs only when there is load level goes in stage when it needs cooling to the internal circuit MoFFETs, whereas this inverter's fan always running and annoying a lot. I am looking for support on this concern. Also, I am curious to know amphers actually my device/phone is consuming during charge at different ports (using charger, USB1 and USB2). Looking forward to talk to suitable technical expert. Thank you. Hi Sunil, thanks for your trust. You need to click "Apply super user" above to submit the review link, and there is a chance for you to try our 150W power inverter for free. My entire Instagram is filled with examples of my product reviews. Hi Hallie, you need to submit the review link and complete the application by clicking "Apply Super User" above, thank you for your unserstanding. I’m very happy with my product and the customer service that was provided to me when the unit stopped working. I called and was told that my unit had a 18 warranty and to send it back for inspection and it was promptly replaced with a new one. I’ve had my Bestek power inverter for a year and it was fine till a couple months ago, I called besteks customer service and was told my unit had a 18 month warranty. So I sent it in for inspection and another was sent out promptly. That was good service and I have re-installed the replacement unit back into my prototype solar charger box. It works great. I didn't understand... it's only for facebook user? Hi Emilio, there are no user restrictions. You only need to complete and submit the super user application above, and you'll get the chance for free trial for 150W power inverter. Has worked Flawlessly as my primary power source in my RV. Runs the Smart TV, a Satellite Receiver as well as a Bluray player. We have charged our iPads and iPhones daily when travelling between Canada and Mexico. I would recommend Bestek Inverters to anyone who needs a Simple to use and reliable product. Thank you for the invitation but I don't use Facebook to engage the web. Hi Stan, our web page is not only available with facebook login, you can use your BESTEK registered email to login, just have a try! Hi Ravi, thank you for supporting BESTEK. The review link should be submitted to the Super User application above. You can click" Apply Super User" to add your review link and complete the submission. Hi Traci, thank you for supporting BESTEK. Now you can have a chance to try our 150W power inverter for free only by completing and submitting the super user applicaiton above, come and join us. Hope I get picked to try and collaborate with anyone.Thanks!! Hi Sarah, thank you for supporting BESTEK. Now there is a chance to try our 150W power inverter for free, you can click" Apply Super User" above to add your review link and complete the submission, come and join us. Bestek Super Users group is open for applications! Check it out. Hi Kathi, thanks for your participation. You can click" Apply Super User" above to add your review link and complete the submission. Hi Melvin, it's very simple, you only need to click" Apply Super User" above to add your review link and complete the submission. Hi Katie, thank you for supporting BESTEK. The review link should be submitted to the Super User application above. You can click" Apply Super User" to add your review link and complete the submission. How exactly does this work? I am confused. Hi Kimberly, it's very simple. You only need to complete and submit the super user application above, and you'll get the chance for free trial for 150W power inverter. Just came back from a weekend trip to London and used by Bestek universal travel adapter 220v to 110v voltage. It powered everything, including my CPAP machine. I love the USB power ports and the fact that you have 3 110v outlets. Great product! Hi Daniel, thank you for your trust. You need to complete and submit the super user application above to get the chance of free trial for our 150W power inverter. Hi Luliana, thanks for your support. You can click" Apply Super User" above to add your review link and complete the submission. Bestek products are the best! I highly recommend them. I am still a tad confused as to what is expected of me? Do I need to do anything on video as opposed to doing so. Hi Brenda, it's very simple. You only need to complete and submit the super user application above, and you'll get the chance for free trial for 150W power inverter. Hi Clifford, thanks for your support. You can click" Apply Super User" above to add your review link and complete the submission. This is a smaller flashlight that can easily fit in your pocket. It has a nice weight to it and feels like it is well made. The beam on this flashlight cannot be changed but it does have different brightness levels. It comes with a strap and a charger cable that can be used with any USB charger. To charge the light unscrew the back cap to reveal the charger port. The flashlight is very well made the beam is bright and It last a long time on a single charge.